Love among the ruins of Burn-Jones brings more than $ 22 million to London’s Christie on July 11, 2013. This sets a new world record for the artist’s creativity, the third highest auction price for Victorian painting, and the high price ever given for the sale of Victorian painting in London in the 19th century. Lovers are almost always selfish. They do not care about others, but what about those around them – to the rest of the world! The main thing is to quickly retire, enjoy each other’s company, cherish every moment spent alone with your loved one. And, by no means always for intimacy, to which it is still necessary to grow and mature. English artist Edward Bern-Jones, whose painting “Love in ruins” at auction in the summer of 2013, was sold for an unexpectedly fabulous sum, is not so known to the general public, except to connoisseurs of art. But his modest talent, perhaps, still awaits his time and an adequate assessment. The very word “ruins”, if you do not see the pictures, sets the decadent mood – you involuntarily start imagining ruins, chaos everywhere, possibly even dead bodies. However, these are deceived expectations, which, however, is encouraging. The place where the artist “spied” for the two lovers, it is difficult to call ruins in the literal sense of the word – it’s rather a deserted castle, in the courtyards and passages of which the weeds and even trees were rampant. Nestled on the steps of the porch, the young couple seemed to be frozen. The young man closed his eyes dreamily and tilted his head to the beloved’s hair. She embraced him convulsively by the neck and tensely peers into the distance. The face reads anxiety and fright, the girl as if foresees the coming misfortunes that they can not be together. 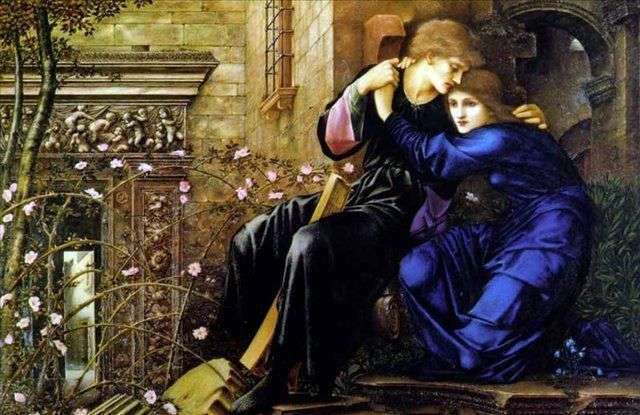 Description and meaning of the painting Love among the ruins by Edward Burne-Jones.